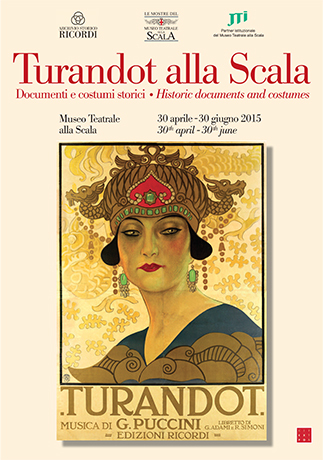 On the occasion of the performance of Turandot at Teatro alla Scala, that the First of May will mark the starting of the Universal Exposition in Milan, will be inaugurated the exhibition Turandot alla Scala. Few premieres at the Scala generated an excited anticipation as intense as that of Turandot in 1926, and few premieres in the history required a so great effort from a publisher to put on the stage and guarantee a success. Concerning this majestic but incomplete opera, the role of the publisher Ricordi, was characterized by an intense participation in many phases of the preparation and thereby its archives preserve unique and precious materials, of great interest for the scholars and lovers. In the exhibition at Museo Teatrale, which open on the occasion of this performance of the extreme masterpiece by Puccini, Archivio Storico Ricordi exhibit for the first time, the autograph pages of the famous Vincerò from the aria Nessun dorma, and a fascinating sampling of original documents of the immense collection preserved: set and costume designs for the world premiere production, letters, collectors’ editions, publicity material, and more. For the first time could be appreciate, side by side, a page of the final sketch by Puccini and the equivalent by Berio, thanks to Paul Sacher Stiftung, Basilea. To enrich the exhibition, as additional proof of legendary stage productions of the opera, will be exhibit beautiful original costumes from the La Scala collection.